Alzheimer's Disease is a gradually progressive dementia that is affecting cognition, behavior, and functional status. This map links between the main points in AD including; clinical presentation, diagnosis, etiology and risk factors, pathophysiology, treatment and monitoring. And here are some parts of the map. This image shows part of the map explaining in a logical sequence the pathophysiology of Alzheimer's disease. Note that current medications do not cure AD or reverse its pathophysiologic process. They aims to symptomatically treat the cognitive difficulties and treat psychiatric and behavioral sequelae. - Patients who pose a danger to self or others. - Patients having symptoms that are interfering with function. Includes; Antipsychotics, Antidepressants, and Anticonvulsants. Each category is discussed thoroughly in the map. 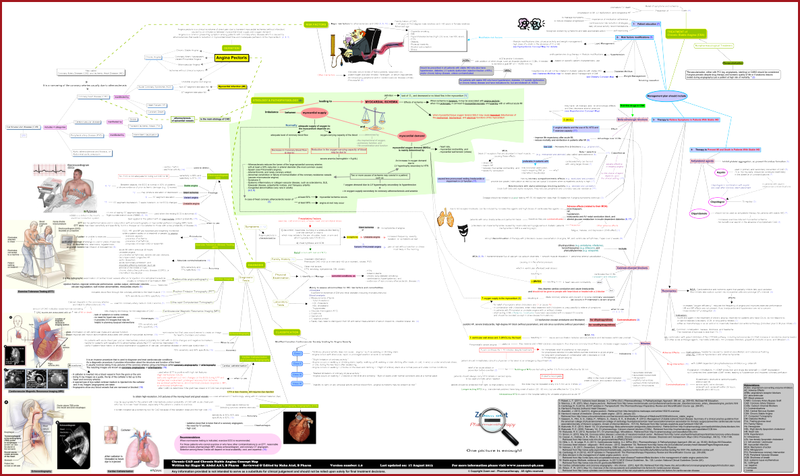 Let’s study diseases easily through a “One Picture” view for each disease. With a massive amount of information you have to study about each disease, it is easy to find yourself stuck with a studying material that may provide all information required but not helpful for studying, memorization, and preparation for exams and/or practical life. At Zoom out – Pharmacotherapy our aim is to represent diseases in a creative way that provides meaningful learning dedicated to improve clinicians’ practice with a focus on pharmacotherapy and disease management. Our maps will help you understand diseases and pharmacotherapy, memorize and recall information easily, and improve your practice. Pharmacotherapy is the practice of treating diseases with medication. When you "Zoom Out" a picture, you most probably see it from all its sides with all its related contents. And when you "Zoom Out" a map, you can find the best way to reach point (Y) starting from point (X) and so on. This is because the map is made to be "one unit" with every possible connection between far and near locations. 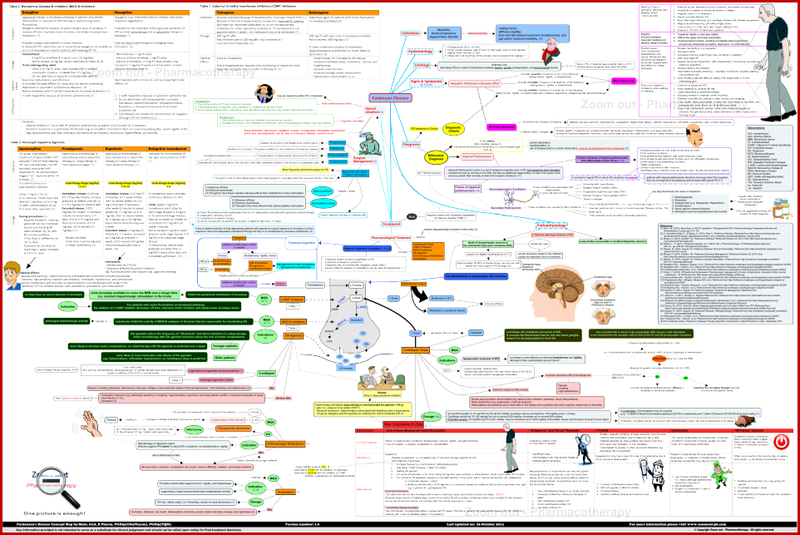 Zoom out - Pharmacotherapy is made on the basis of (Concept Mapping) and (Mind Mapping) techniques. The idea is based on building knowledge upon each other and linking between information. And finally, representing every disease as one unique large picture that links between all aspects of the disease including: definition, etiology, pathophysiology, diagnosis, treatment, prevention, etc. Representing a disease as "One Unit" with every possible connection between information is an essential factor for achieving better understanding of diseases and better case management during practice. How Zoom out can make your study effective? 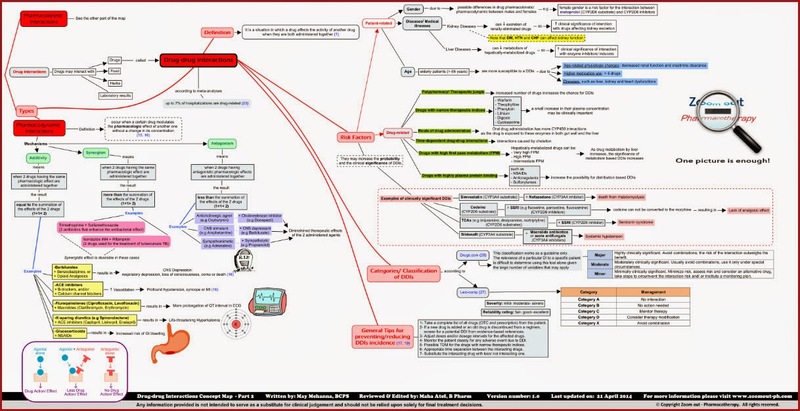 Concept maps and mind maps are very effective tools for studying and memorization. They assess meaningful learning; connecting between information in a logical way that is matches brain structure and make it easy for your brain to keep information for a long period of time. Have you ever noticed the similarity between a map and your brain neurons? This what makes concept mapping and mind mapping effective and this what makes them brain-friendly. Imagine that you are studying a disease from one paper that provides you with information collected from about 20 pages. So the knowledge you gain from one large “Zoomed out” page is the same found in a 20-pages chapter from your textbook. This is a real challenge that makes Zoom out maps unique regarding the content of the map. Zoom out maps are not outline maps; they contain detailed information that you need to prepare for your exams or your practice. You can replace too many pages from a book with a comprehensive map that has the same content represented in a creative way. If you are a student, then Zoom out maps will guide you towards effective “medical decision making”. This means that the map with its logical organization of knowledge will help you set your mind to work in a logical way during practice. And if you are already practicing as a clinician, then our maps will help you refresh your knowledge and maximize your ability to use it into practice. At Zoom out – Pharmacotherapy, we focus on narrowing the gap between theoretical knowledge (that you gain to pass your exams) and the practical life. How do we make Zoom out maps? We build information upon each other, i.e. building upon existing / prior knowledge. e.g. : the pathophysiology is build upon the normal physiology. We make links between related information. e.g. : the pathophysiology is linked to diseases' signs and symptoms. Besides, diseases' pathophysiology is linked treatment. We use table comparisons to compare between medications if needed. We use expressive images and clip arts. This site helps whoever studies, practices, or teaches pharmacotherapy, therapeutics, or disease management. Whether you are in pharmacy, medical, or nursing fields, you will find Zoom out - Pharmacotherapy useful for you. Understand and study diseases effectively. Easily recall the knowledge you gained about a certain disease. Make the right decision about a corresponding medical situation. Generally, drugs may interact with other drugs, food, herbs, and laboratory results. 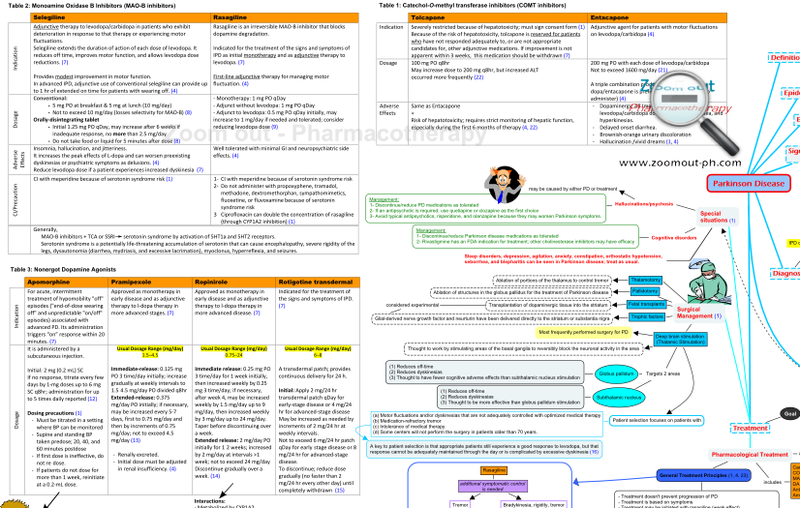 This concept map focuses on drug-drug interactions types, mechanisms of interactions, preventive measures, and risk factors along with a sufficient number of examples of the most common and the most clinically significant drug-drug interactions. 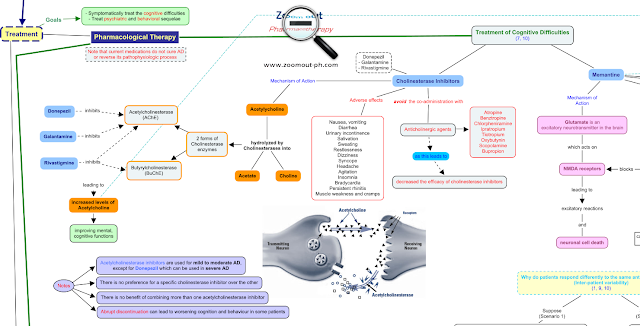 Here is an overview about our unique “One Picture” on Drug-drug interactions (DDIs) concept map from Zoom out - Pharmacotherapy. The map starts with a definition of drug-drug interactions which is a situation in which a drug affects the activity of another drug when they are both administered together. These interactions occur when the precipitant drug affects the plasma concentration of the object drug through changes in the absorption, distribution, metabolism or excretion of the object drug. It occurs when drug(s) bind to another in GIT. The map explains the difference between (Adsorption) and (Chelation); the two mechanisms responsible for drug binding. Drug binding doesn’t usually cause harmful interactions, as it may be useful clinically. Find out more in the map. These changes affect what is called Gastric Emptying Rate (GER) and consequently affects drug absorption rate and/or extent. Know from the map what GER is and which drugs increase and decrease GER and drug absorption rate. An interesting example; how pretreatment with propanthelin enhances digoxin bioavailability? Understand the mechanism as shown in the map in the form of a flowchart. The map let you understand the effect of GI pH on weak acidic and weak basic drugs extent of absorption. See the image below. It is showing part of the map that concerns intestinal flora effect on drug absorption. Two examples provided; antibiotics co-administered with digoxin and co-administered with oral hormonal contraceptives. 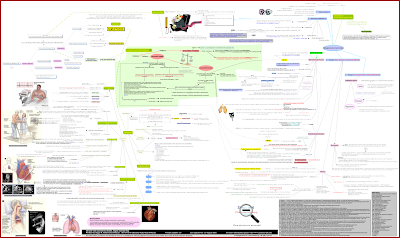 Hypertensive crisis caused by co-administration of tyramine containing food with MAO inhibitors is a clinically significant drug interaction that is shown as an example in this part of the map. Distribution occurs after the absorbed drug enters the bloodstream. It is carried by plasma proteins to reach its site of action and exerts its pharmacological effect. Transport plasma proteins are albumin and alpha1-acid glycoprotein (AAG). Certain diseases and conditions as: liver cirrhosis, renal failure, inflammatory diseases, and pregnancy can change the serum concentrations of these plasma proteins and consequently affects drug distribution. Drug-induced decrease in concentration of binding protein. Also mentioned in the map, four cases in which the clinical significance of drug displacement interactions increase. Many administered drugs are extensively metabolized in the liver by hepatic enzymes. The most common among these enzymes are cytochrome P450 enzymes. Know about these enzymes’ nomenclature, function and other information through this part of the map. You’ll also find a table with some examples of interacting drugs through inhibition of cytochrome P450 enzymes. There is also a table with some examples of interacting drugs through inhibition of cytochrome P450 enzymes. They are drugs that have no therapeutic action until they are metabolized into active compounds. 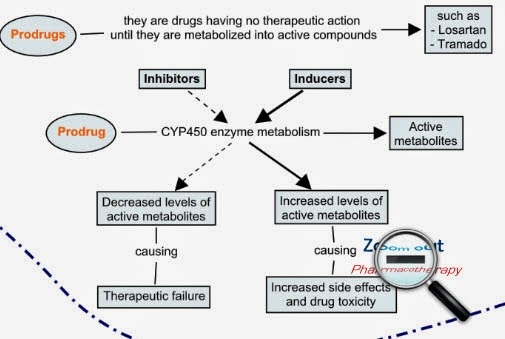 As CYP450 enzymes have a role in the activation of prodrugs, then enzyme inhibitors and inducers can interfere with the activation of prodrugs. 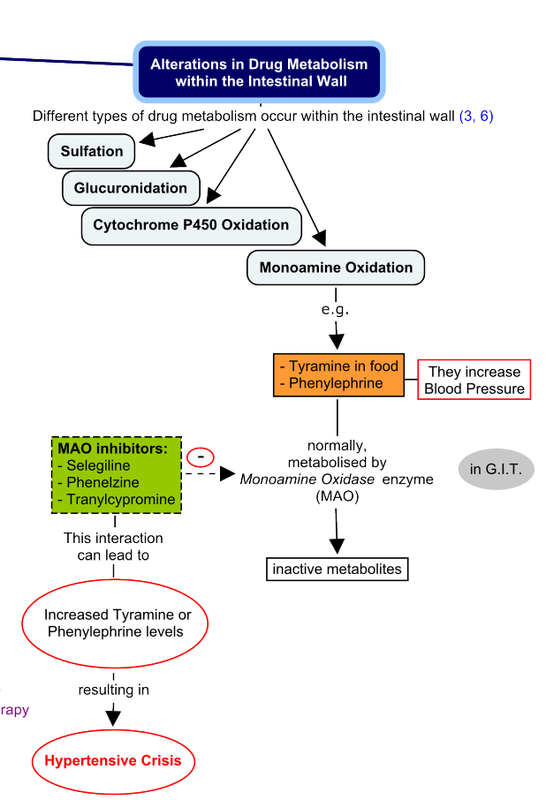 Know more about the possible mechanisms of inhibition or induction of CYP450 in case of produrgs as losartan and tramadol through this part of the map. Excretory organs are: the biliary system, the lungs, the skin, and the kidney which plays the most important role in excretion. 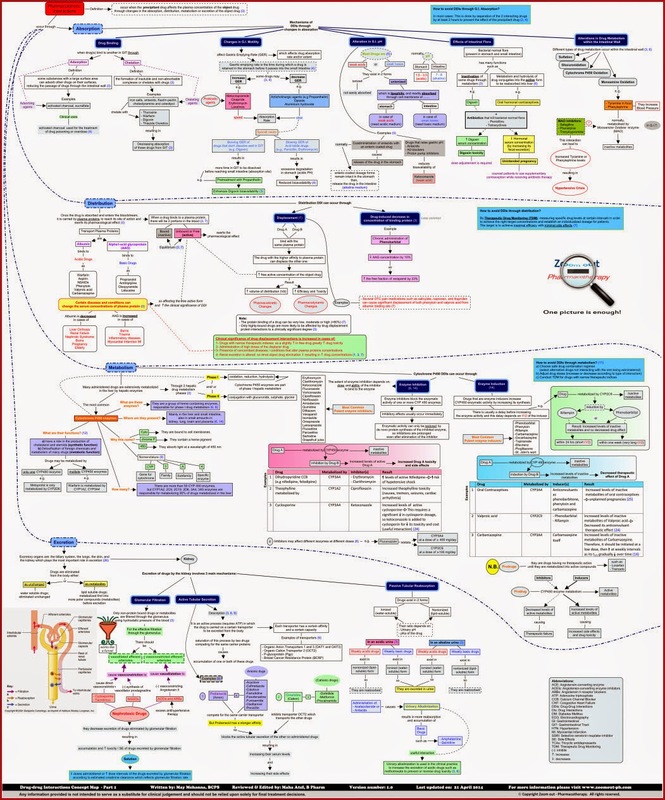 In a logical way, the map explains how glomerular filtration takes place and how nephrotoxic drugs as: cyclosporine, tacrolimus, non-steroidal anti-inflammatory drugs (NSAIDs), angiotensin-converting enzyme inhibitors (ACEIs), and angiotensin II receptor blockers (ARBs) decrease excretion of drugs eliminated by glomerular filtration resulting in accumulation of these drugs and increased toxicity. It is an active process (requires ATP) in which the drug is carried on a certain transporter to be excreted from the body. Saturation of this process by two drugs competing for the same carrier proteins causes accumulation of one or both of these drugs. Two examples of drug-drug interactions due to drugs competing on active tubular secretion are mentioned in the map. They include: probenecid and cimetidine. Here is a glimpse of this part as shown in the map. 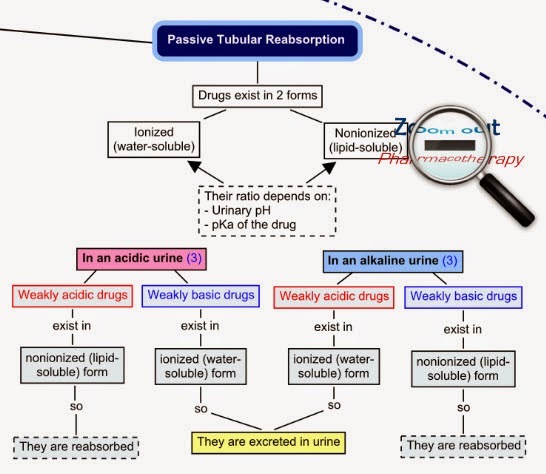 Then, know how urine alkalinization results in more reabsorption of basic drugs and increases the excretion of acidic drugs as methotrexate to prevent or reverse drug toxicity. They occur when a certain drug modulates the pharmacologic effect of another one without a change in its concentration. Pharmacodynamic Interactions occur due to one of these mechanisms: additivity, synergism, or antagonism. Details related to patient’s gender, diseases, and age are stated in the map. You’ve to remember that these risk factors may increase the probability and the clinical significance of drug-drug interactions. 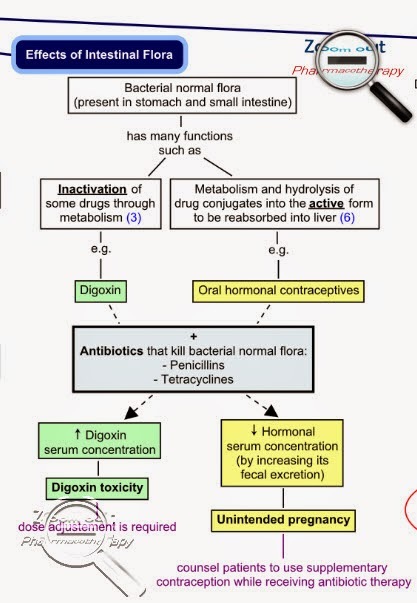 This part is followed by examples of clinically significant drug-drug interactions. This part shows you how DDIs are classified according to two important online drug interaction checkers. These references are (Drugs.com) and (Lexi-comp). This is the final part of the map which provides 7 general tips to prevent and reduce the incidence of drug-drug interactions. The map also contains hints on how to avoid drug interactions caused by changes absorption, distribution, metabolism, and excretion. To know them and to get the full map, please order below. I'm sure you'll be surprised by its comprehensive content shown as mini-maps that makes the topic easy for understand and memorization. Besides its content of more than 40 examples of drug-drug interactions. The map is split into pages to be printed on several A4 papers. After printing them, you have to tape the edges together to make a folded poster.